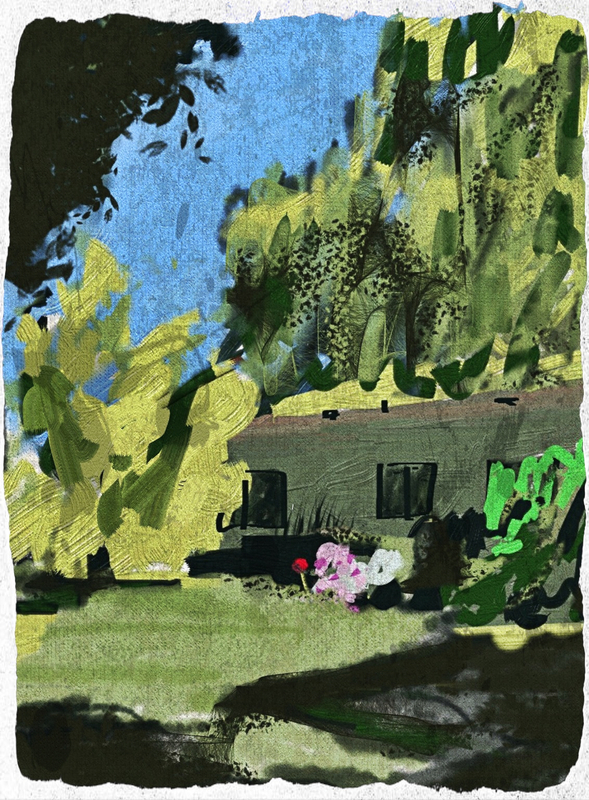 I painted this on my iPod Touch in the back yard. It was late afternoon on a beautiful Spring day. Here’s a gallery showing the progress of the work starting with a photo taken on my iPod Touch then roughly sketched in with ArtRage (also on the Touch). I then sketched it again in Sketch Club on the Touch. Next I opened both versions on the iPad in ArtRage and combined pieces of each into a new version. I then used Pixlromatic to alter the color balance and to add texture and a frame. I saved two Pixlromatic versions (one more contrasty than the other). Finally I combined both of these versions in Blender to achieve the final version.